There are 7 posts filed in How to sell (this is page 2 of 2). Finding cool company names isn’t an easy task. Gladly, there are different techniques which help you finding business names ideas. It doesn’t really matter which other techniques you use learning about your competition is always valuable. Start googling, use yelp, etc. Write down all the names you can find and start categorizing them. I will use dog groom as an example. Let’s say we search dog groomers in NYC. I looked up the first 30 entries in yelp. You can see a lot of wordplays and some location- and personal-related names. You can orient your name on your findings. Whatever company name you choose it has to have three attributes. The first one is easy to remember. It doesn’t matter how great and clever or cool your business name is if nobody can remember it. A good test is to take your top 5 – 20 business names ideas and write them on a paper. 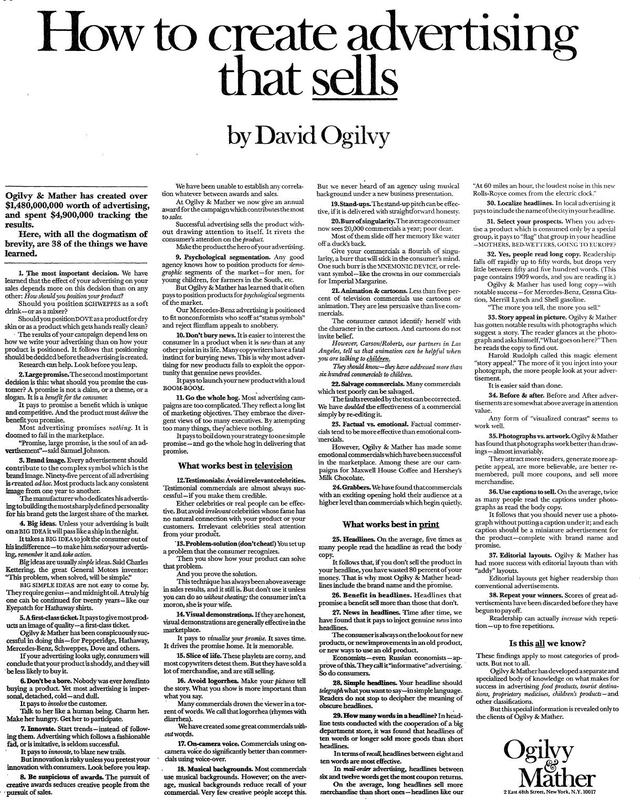 Give this paper to a friend or customer or whatever and let them read it for a short time. After a few minutes you ask which name they remembered. The second most important attribute is spelling or pronunciation depending on your channel. It’s about translating the idea of a name into reality. Let’s say you got an non-internet business then pronunciation should be your second highest priority. People will talk with each other and they will talk about businesses they loved. If they can’t pronounce your name because it is in French, Latin or Zulu you’ve lost. Same thing applies here. Let people pronounce your name and check which one is the easiest to pronounce. The third attribute is spelling. It’s basically the same as pronunciation but for the internet / sms. Also people may want to look up your business online so spelling is essential. A simple is rule is that if you can’t write your own name without looking it up then it’s to complicated. An other example are those startup names from about 2 – 4 years ago like Flickr, Twttr (now Twitter), etc. Horrible to write but twitter did it right with renaming their service. If you are just lazy there’s one simple trick to cool company names but it doesn’t work for every industry. It works the best for local businesses. Let’s continue with our dog groomers example. You want to open your shop in NYC but you can’t come up with a name. Easy. Go to yelp and look for dog groomers in other cities which are away far enough. For NYC: Boston, LA, Denver, etc. could be great locations to check out. Often you can copy the name directly or slightly adapt it. A real great tool is the phonological loop. It’s explained in detail in the video below. The main idea is that there is a memory function in your brain that starts repeating things over and over. Earworms or brainworms, i.e. catchy songs are a great example of this. 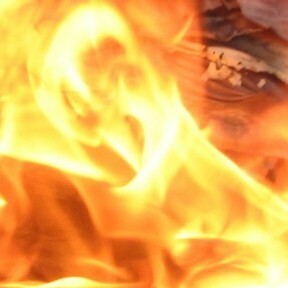 A similar effect can be generated by using rhymes in your name. In the dog grooming example. Here are some ideas: Booming Dog Grooming, Humor Dog Groomer, Blooming Dog Grooming, etc. It’s easy and you can start with different words, just look in a thesaurus and brainstorm a bit. The second technique for creating catchy names is using alliterations, i.e. using the same starting letter. You can look up words with the same letter in a dictionary without problems. Again examples: Dave’s Dog Dojo or Grooming Grove. This techniques works well for more product-oriented or result-orientied businesses. Some examples are Quickbooks (quick + bookkeeping), rapidshare (rapid + sharing), simplyhired (simple + getting hired), soundcloud (sound + in the cloud), etc. These are pretty good names because they are easy to remember and they can be powerful because you can advertise your USP directly in your name. For the dog grooming examples this could be names like BeautifulDog or HappyPuppy or easyGrooming. The last one becomes more popular in the moment. The idea is to use just one common word and work with it. Examples are Apple, Simple or Box. To get these names off the ground however is really hard and I wouldn’t recommend it if you don’t have experience in brand building and/or a big budget. For the dog grooming example this could be Groomers or Dogs. I found this post in my drafts. No idea why I never posted it. It is two years old, still interesting. Enjoy. I was just surfing the web and was interested in current laptops. I’m currently using a 15.4 inch MBP and just wanted to know which laptops are currently available, how much they cost and which specs they have. Three main ads, tons of ads on the right side, one organic result from amazon and some results from Google’s product search. I was presented with a loading screen and the slogan “You control the journey. YOU decide, but choose quickly before time runs out.” What? I just wanted to see 15 inch notebooks ad not making life-threating decisions. Therefore, I scrolled down, saw the quite cool looking Ultrabook and a link to the shop. Surely, I understand that this was more a branding campaign but waiting about 15 seconds before the flash stuff loads, I just a little bit too much in my opinion. Oh yeah! I get tons of laptops with a price and rating. Even got a filter on the right if I want to narrow my search. I would also get 10 GBP off, if I enter the Coupon code. Not bad. Okay. Ultraportable up to 13″, Full size PCs, standard laptops up to 14.9″ and entertainment laptops with 17″ and over. Hold your horses! I wanted a 15″ laptop?! The fun thing is that if you click on the “View all HP laptops” banner, you get selection laptops between 15″ and less than 17″ inch. 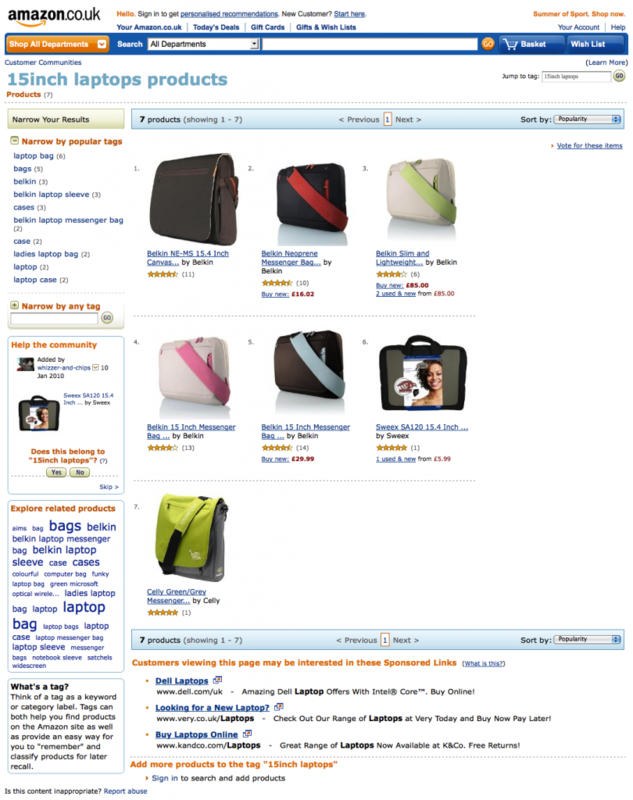 Yep, laptop bags. I don’t know why but laptop bags. 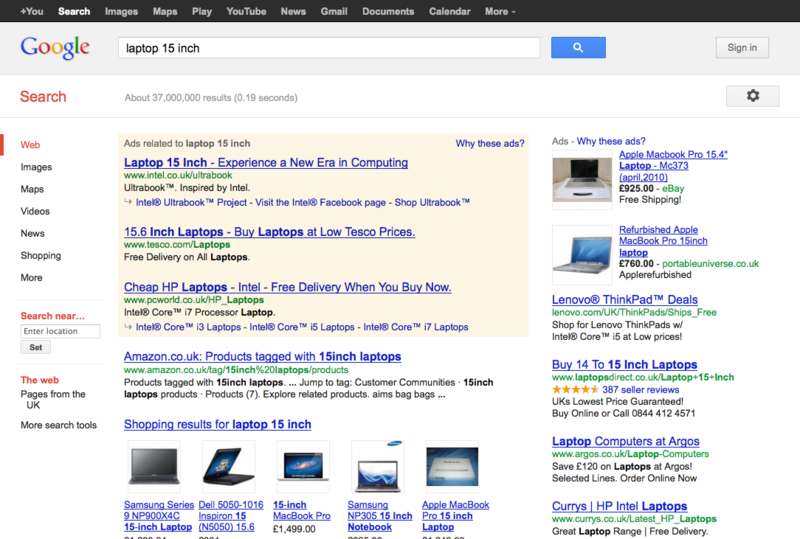 Okay, we get one ad from pcworld, some organic results, Google’s product search and some ads on the right. Cool, we get a useful results. The Zenbooks start at the 8th item but are still on the page. Good enough! The fun thing is that the first two organic results are dedicated pages to this version of the Zenbook. 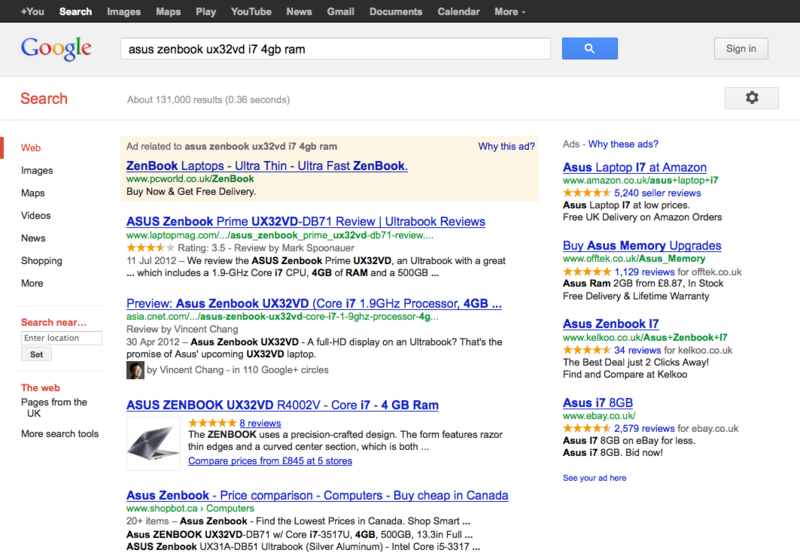 And Google’s product search, does it really well. Look at this. I got a picture, a rating, the right version and a comparison of online shops with seller ratings and price. Make your product great and beautiful: A great product allows you to promise great benefits which the product can actually deliver. In addition, your product should look beautiful. Man is a visual animal. If you product looks awful, they conclude that you product is awful. Sell in the headline and caption: The most people scan pages. They see the headlines and captions. Don’t miss these opportunities to sell your product. Use news: Often marketers neglect this opportunity (however bloggers often get it). How can you react to topical news? Imagine that there is big news on digital data theft. Depending on what you are selling, you could write an article about preventing data theft, release an ad that your servers are more secure or, if you have deeper knowledge, giving interviews to journalist. 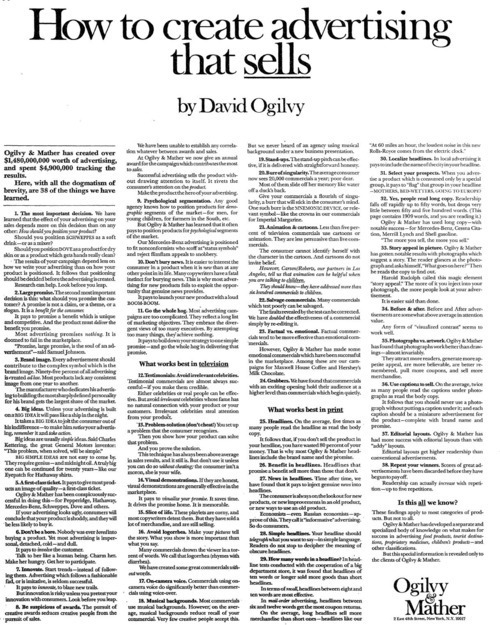 Ogilvy & Mather has developed a separate and specialized body of knowledge on what makes for success in advertising food products, tourist destinations, proprietary medicines, children’s product – and other classifications. That is, you can tackle the problem on your own or hire experts who are specialized into these sectors and who can afford to give away valuable information for free.